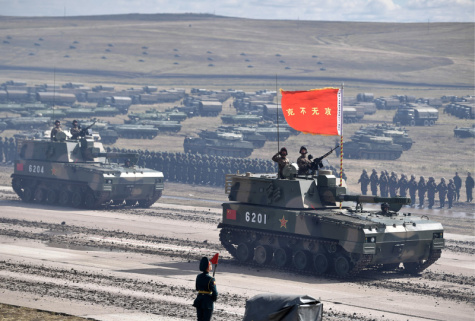 Russia’s largest strategic military exercise after the Cold War — “Vostok 2018” — kicked off on September 11, and more than 3,000 troops and large quantities of military hardware from the Chinese People’s Liberation Army (PLA) took part in the drills. Most western analysts are asking the same question: Who does the military exercise target? The massive and impressive “Vostok 2018” military exercise involves 300,000 Russian troops. From a Chinese perspective, the military exercise, first of all, aims to demonstrate Russia’s military prowess, rather than prepare for a great war against any specific enemy. Russia boasts a vast territory with a sparse population, and takes the most pride in its military strength. It is a tradition for the country to “flex its muscles” from time to time, in a bid to deter potential menaces. It seems that Russia would be more willing to do so when it’s relatively weak. Thus, Russia’s strategic opponents easily feel that the country’s military exercises target them. Of all major countries around the world, this year’s military exercise is geographically closest to China and farthest to the United States. However, China never feels this targets it, and even sent the PLA to participate in the military exercise. Perhaps the United States may feel most uncomfortable because it is most eager to constrain Russia on the international stage. Presumably, China took part in the Russian military exercise for two reasons: One is to consolidate friendship between the two countries and mil-to-mil relations and deepen the China-Russia comprehensive strategic partnership of coordination; The other is to learn from the Russian army in terms of military technology. After all, the Russian troops took part in Syria’s civil war. The Russian forces that performed operations in Syria are among the participants of the military exercise. Undoubtedly, joining in such a military exercise with them is helpful for the PLA to become familiar with actual combat. It’s little wonder that western analysts prefer to interpret the military exercise from the perspective of geopolitics. However, if they indulge themselves in over-interpretation, they will fall into great confusion: overstating the peripheral meaning of the military exercise and even misdeeming it as the core meaning. Frankly, China doesn’t want to be enemy to any country and will continue focusing its attention on economic development for a long time to come. Its fundamental guideline for international relations will remain constantly expanding mutually beneficial cooperation, rather than seeking “expansion” and enlarging its living space by force based on its strength. Therefore, China’s armed forces won’t see any country as a rival or opponent in reality unless it threatens China’s core interests. The China-Russia comprehensive strategic partnership of coordination is defensive in nature, which, put it vividly, aims to enable the two countries to gain a sense of security through supporting each other “back-to-back.” This is a typical defensive posture. If both countries start off for attack, they cannot stand “back-to-back” any more. China’s military activities are mostly carried out on coastal waters, and may go farther in very rare cases. Coastal waters remain the political home and psychological base for the Chinese military. Both China and Russia firmly declare that they are partners rather than allies. Meanwhile, other countries should not constrain China and Russia, and especially should not arouse a sense of crisis among the two countries by imposing severe security challenges. The global strategy should be adjusted to make all parties have a basic sense of security. This means other countries should make China and Russia feel they have an urgent need to enhance their military cooperation. Dedicate geopolitical frictions are easy to emerge between neighboring major countries, especially for China and Russia who endured much ups and downs in bilateral relations in the past. But now, China and Russia enjoy a friendly relationship, but instead they both have frictions with a major country that is far away. Therefore, it’s misleading to discuss the potential target of Russia’s military exercise in which the Chinese military forces participate. Western analysts should reflect on why their countries cannot become friends of China and Russia, just as what the two countries have done.